This recording of Brand X captured live at the peak of the band's career has never been previously issued. Brand X was another one of those bands who were beloved of other musicians and the more discerning of critics but which despite everything, never had the commercial success that it deserved. They were a jazz fusion band active 1975–1980. Noted members included Phil Collins (drums), Percy Jones (bass), John Goodsall (guitar) and Robin Lumley (keyboards). Not long after jazz/rock fusion greats Brand X put out their 1980 album, Do They Hurt?, the band members went their separate ways (until their comeback in 1992, which only featured Goodsall and Jones). This is a soundboard recording from one of Brand X’s shows recorded at the Roxy Theatre, Los Angeles, California, on Sunday, 23rd September 1979 11:30 pm to 1:00 am, recorded shortly after the release of Product. 'As an historical document, it’s interesting to hear Phil Collins and the band ham it up (“You’ve been a credit to Poland…”) with silly asides before launching into lifelike versions of not-so-old favorites plus new songs from the just-released Product. The group did a limited tour of the UK and US to support Product, using the same setlist from night to night and alternating beetween “Nuclear Burn” and “Access To Data/The Ghost of Mayfield Lodge” as the encore. If you’ve exhausted all of the official releases and are looking for something to nibble on late at night, Live At The Roxy L.A. has its appetizing moments. “Dance of The Illegal Aliens” and “Nuclear Burn” (the encore for this evening), for example, seem to take on a life of their own on stage. If you don't know Brand X, then you quite possibly don't know the roots of English progressive jazz rock fusion. This seminal band featured, at the core, John Goodsall on guitar, Percy Jones on bass, Robin Lumley on keyboards, and Philip Collins on drums. Yes that Phil Collins of Genesis fame. These mates jammed on a regular basis, if anything, for the shear pleasure of experimentation and camaraderie. Then Collins brought manager Tony Smith to the gig, and he concluded that they should record. The first album was 1976's quite successful Unorthodox Behavior. The rest, as the say, is history, with many more additional albums with curious names (but no significant meaning to them. I was a fan back in the day and nearly every one of their albums. UK label Gonzo Multimedia has seen fit to re-issue three recordings from the band's catalog: one a prequel, so to speak, of their earliest stuff, another a live album, and the third, a re-issue of the seventh album, last to have Phil Collins, Is There Anything About?. I'll speak to each one briefly. Missing Period, as hinted to above, are the earliest recordings of Brand X, beforeUnorthodox Behavior, and recently recovered by Goodsall from family members. Perhaps the most interesting thing about this album (and the others as well) is that they are analog recordings set to tape, yet still have an amazing freshness. Something to challenge our current digital world view. Regarding the musical beginnings of Brand X, you'll discover some musicians deep into improvisation and experimentation as the explore convergence of jazz and rock fusion. While all track are entertaining and telling of the band's direction, my top picks would be Ancient Mysteries and Miserable Virgin. Live at the Roxy LA, recorded in 1979, finds the band in high gear with some commercial and popular success. Yes, the band did tour and successfully so. Not unlike the those early recordings, this one is from the theater's PA monitor-mixing board, in cassette form. Brand X recorded every show and rehearsal the same way; many were lost, this one survived. Again, this all analog stuff, a bit clumsy and muffled at times, but the music comes through. There's also some quaint banter between the band, displaying more than a little bit of Brit dry humor. Favorite tracks: all, but especially Disco Suicide and Malaga Virgin. Is There Anything About is the re-issue of the 1982 album, the last to feature Phil Collins. First, the re-issue does not follow the original song lineup from vinyl, but I don't think it matters. It also includes some additional personnel: John Giblin, bass, Peter Robinson, keyboards, Raf Ravenscroft, saxophone, and Steve Short, syndrums. 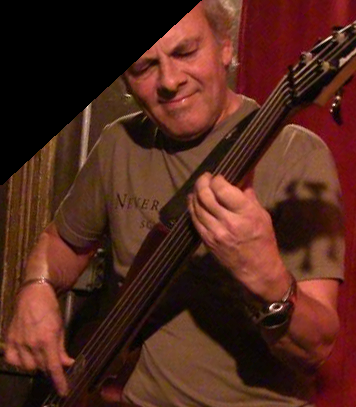 Excepting Jones, who plays bass on only one track, these players aid rather than replace the core band. Is There Anything About certainly stands in the Brand X tradition, offering some new material, as opposed to the previous Do They Hurt, which was merely out takes from Product. That album, in my opinion, was their last best album. So this one finds the band alive, yet fading. There's a piece called Swan Song that may have been more prophetic than the band could know. Yet, Is There Anything About is still entertaining and worth a Brand X fan's time. Top picks: TMIU-ATGA ("they're making it up as they go along"), Modern, Noisy and Effective, and the title track. So there you have it. Grab them while you can. Easily recommended. In 1979, the band Brand X , a small jewel of British jazz fusion, at the peak of his art. His first four albums "Unorthodox behavior" (1976), "Moroccan Roll"(1977), "Masks" (1978) and "Portrait" (1979), matching the live "Livestock" (1977), revealed a perennial work and technical, complex and elaborate, but always captivating with their energy and prowess of its creators. pieces must say that Phil Collins (drums, Phil Collins of Genesis ), John Goodsall (guitar), Percy Jones (bass, a time in Soft Machine and The Liverpool Scene , a group of 60) and Robin Lumley (keyboards) are the undisputed masters in their respective arts. Their association in Brand X delivers exceptional results with a technical standpoint. We are not quite here in the progressive rock but in jazz fusion, as demonstrated by the almost systematic absence of vocals on the first albums. In 1979, Brand X innovates a bit with "Portrait" , an album more influenced by the progressive. Radical fans of Brand X will also deny this album a little, regretting that jazz fusion orientations are somewhat obscured, the album even includes singing on some tracks. This is also Phil Collins who cares to vocalize. At the time, he is back in the group after 1978 when it was Chuck Burgi who had officiated on"Masks" . album "Portrait" is the subject of a tour at its output September 1979. It was during a concert at the Roxy in Los Angeles on September 23 a pirate recording is performed. This bootleg has circulated in various forms for many years now and here is a little more formal version was marketed by Gonzo Multimedia. Label "Live at the Roxy" includes six tracks mainly extracts from "Portrait" but also two pieces of "Moroccan roll" (1977) and one of "Unorthodox behavior" (1976). Once impeccable technique musicians romp over long ranges (again we find "Dance of the illegal aliens" , "Malaga virgin" , "... And so to F ..." , "Nuclear Burn" ). This listening is exciting but is slightly hampered by a sound that is not at its optimum, this concert is, as I recall, from a pirate. The pieces lost in sonic accuracy, however they recover gross energy, the atmosphere of the room is well reproduced.Spectators show their enthusiasm in small groups and musicians sympathetically Brand X harangue the crowd. This disc remains still recommended despite its lower sound quality because it keeps track of excellent interpretations of solid pieces of instrumental resources . In 1979, the band Brand X , a small jewel of British jazz fusion, at the peak of his art. His first four albums "Unorthodox behavior" (1976), "Moroccan Roll"(1977), "Masks" (1978) and "Portrait" (1979), matching the live "Livestock" (1977), revealed a perennial work and technical, complex and elaborate, but always captivating with their energy and prowess of its creators. pieces must say that Phil Collins (drums, Phil Collins of Genesis ), John Goodsall (guitar), Percy Jones (bass, a time in Soft Machine and The Liverpool Scene , a group of 60) and Robin Lumley (keyboards) are the undisputed masters in their respective arts. Their association in Brand X delivers exceptional results with a technical standpoint. We are not quite here in the progressive rock but in jazz fusion, as demonstrated by the almost systematic absence of vocals on the first albums. In 1979, Brand X innovates a bit with "Portrait" , an album more influenced by the progressive. Radical fans of Brand X will also deny this album a little, regretting that jazz fusion orientations are somewhat obscured, the album even includes singing on some tracks. This is also Phil Collins who cares to vocalize. At the time, he is back in the group after 1978 when it was Chuck Burgi who had officiated on"Masks" . album "Portrait" is the subject of a tour at its output September 1979. It was during a concert at the Roxy in Los Angeles on September 23 a pirate recording is performed. This bootleg has circulated in various forms for many years now and here is a little more formal version was marketed by Gonzo Multimedia. Label "Live at the Roxy" includes six tracks mainly extracts from "Portrait" but also two pieces of "Moroccan roll" (1977) and one of "Unorthodox behavior" (1976). Once impeccable technique musicians romp over long ranges (again we find "Dance of the illegal aliens" , "Malaga virgin" , "... And so to F ..." , "Nuclear Burn" ). This listening is exciting but is slightly hampered by a sound that is not at its optimum, this concert is, as I recall, from a pirate. The pieces lost in sonic accuracy, however they recover gross energy, the atmosphere of the room is well reproduced.Spectators show their enthusiasm in small groups and musicians sympathetically Brand X harangue the crowd. This disc remains still recommended despite its lower sound quality because it keeps track of excellent interpretations of solid pieces of instrumental resources . 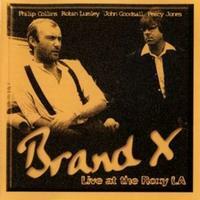 This is a newly reissued live album from Brand X. It should be pointed out that the sound quality is pretty good, but not great by modern standards. The performances, on the other hand, are pretty awesome. They really run the gamut from the fusion type stuff normally associated with Brand X to things that feel similar to Phil Collins' other band, Genesis. There are even songs here with vocals. However you slice it, this is well worth having. This comes in gradually with atmospheric tones and a persistent drum beat guiding it early. It’s after the three minute mark before it powers up substantially. It gets into some serious rocking sounds as it continues. By around the five minute mark it’s drop back towards atmosphere. Then piano takes command of the piece creating some delicate and intricate melodies. It powers back up from there into some seriously energetic and rocking fusion sounds. The guitar really creates some awesome lines of melody over the top. Then they drop it back again, but not as far this time. The cut continues evolving work out to some seriously furious progressive rock after a time. It rises and falls in terms of intensity and volume, and seems to wander between the more jazzy and more rocking side of fusion. It’s definitely one heck of a ride. It ends with some talk to the crowd. A cool jazz groove opens this as the group work forward from there. I really love some of the bass driven sections of this, but the whole thing is awesome. It’s got less pure prog, perhaps, focusing more on the fusion side of the equation. Still, there are some prog moments. Like after the section end around the three minute mark. When they power out from there it resembles Frank Zappa for a moment or two, and then fires out into more definite rock territory. A burst of Zappa-like sound drops us down to a mellower, piano based jam that has both the prog and fusion sounds in place. It continues to shift and change, moving more towards a somewhat mellower fusion motif for a while. The energy rises up without bringing it really into the hard rocking territory. The piano gets more opportunity to show off in this section. That said, the guitar works well here, too. It does eventually build up to more rocking sounds, though. That guitar drives it when it does. Then it explodes into some freeform fusion for a short burst. It drops way back down from there. The piano comes up creating the melody. Then they fire back out into a rocking fusion jam. Some scorching hot guitar soloing emerges further down this musical road. It even gets almost metal later. That section eventually takes it to the close. This song is different for the Brand X catalog as it has vocals. It definitely lands in healthy progressive rock territory. In some ways comparisons to Genesis wouldn’t be out of the question. Of course, Collins’ vocals beg that reference, but it’s more than just that. Some of the music feels similar. It’s definitely not fusion. In fact, I don’t really make out a lot of fusion at all here. It’s just a good rock tune that alternates between mellower and more rocking sounds. Some parts of this even remind me a bit of Rush. They waste no time here as a frantic bit of fusion starts it. Then it drops way down as Percy Jones bass creates some cool melody sections. That instrument holds it in a solo until after the one minute mark when the whole group power out into some serious fusion. It works forward in a somewhat straight line for the first six minutes or so. That said, there are shifts and changes and different instruments lead the way at different points. Then it drops way down for a mellower motif in which the musical explorations continue, just at a more sedate level. At times this section makes me think of some of the mellower side of Pat Metheny’s musical catalog. After continuing in this more sedate way, it works out to a fast paced jazz jam around the eleven minute mark. A cool fusion jam opens this and then it drops back to a keyboard heavy section. As it builds out from there, comparison to the proggier side of mid-period Genesis are valid. The guitar weaving melody lines over the top brings it more into fusion territory. As it launches into a rock groove (with some vocals) this definitely makes me think of Genesis. The guitar soloing during this section is more rock and roll than either the fusion or Genesis comparisons convey. It drops way down after that solo. Then they fire back up into hard rock with a return of those vocals. This really is quite a good combination of that Genesis type sound with more straightforward rock and some fusion. After they leave the stage the crowd creates lots of noise to encourage their return. The encore starts with introductions of the band members. Then a burst of sound is heard and they take it out from there into some classy fusion. This is quite a cool ride. At times it leans toward mellower sides. At times it rocks out in screaming passion. Each member of the group gets a chance to shine here with little mini-solos built into the beast. I particularly like the funky jam around the eight minute mark. The piece continues to evolve but remains fusion throughout. It’s a great way to rap things up. One of the bands that heralded a new era of jazz-fusion, it was Brand X that really brought a more guitar oriented and rock and roll blueprint to the table. Probably one of the ‘lost’ bands from the era, they are best known for being a band that once featured Phil Collins (yes, that Phil Collins) behind the drum kit, but looking deeper into the picture, the guitar of John Goodsall, the bass of Percy Jones, along with the dueling keyboards of Robin Lumley and Peter Robinson; it’s criminal for the musicianship to be overlooked. Three reissues have been unleashed, including a studio album, a collection of rarities, and a live album. The studio album ‘Is There Anything About’ marked the end of an era from the band, as this 1982 release would be the final for almost a decade. Like many records in this aura studio wizardry collides with the musicianship ranging from the steadfast funky groove of “Inpanemia” and the spacey synth prog of “Swan Song,” the album des have it’s mixture of variant vibes; overall it’s slick like Becker & Fagen, risky as the Headhunters, and intense as the Mahavishnu Orchestra, they beheld musical ideology that was their own. One thing that you will notice is that Collins drumming is a lot different from his style in genesis, a much more jazzier syncopated and even intense style; but don’t let that end there, Goodsall’s guitar playing and everybody else involved, hear it for yourself and you’ll get the picture. The Missing Period release is the first official release of the band’s earliest recordings from the mid-seventies, often bootlegged, this is the first time that this music has been officially commissioned by the band. High quality for the most part, the album offers up an extension of the band’s career; High Point: Ancient Mysteries.” The live release, Live at the ROXY L.A. does have it’s gritty quality, reaming listenable, but the good performance showcasing that these guys weren’t just some product of studio magic. Recorded at the Roxy Theater in Los Angeles, California on September 23, 1979, this is just one example of a myriad of tapes that legendary British jazz-fusion act had of their many live shows. Most of which unfortunately have been lost over the years, but this previously unreleased soundboard recording from that night has been recovered by the band and now part of Gonzo Multimedia's Brand X rarities release campaign. Featuring Phil Collins (drums, vocals), Robin Lumley (keyboards), John Goodsall (guitar), Percy Jones (bass), and Peter Robinson (keyboards), this is pretty much the 'classic' line-up of Brand X, and they show why throughout this 6 song set. "Disco Suicide/Algon" just burns from start to finish, complete with raging bursts from the rhythm duo of Collins & Jones (Percy's nimble bass lines are a thing of beauty) as Goodsall's savage guitar licks tear through the mix, weaving about the gorgeous keyboard tapestries of Lumley and Robinson. It's a high energy start to this excellent archival live release. "Dance of the Illegal Aliens" features some atmospheric electric piano & synth, tricky drum fills, and some otherworldly bass grooves courtesy of Jones. Goodsall's searing guitar makes an immediate impact on the rocking "Don't Make Waves", somewhat of a departure for this little 'jazz group', as Collins' lead vocals pair up nicely with the prog/hard rock arrangements. Percy takes center stage on the delicious "Malaga Virgin", a winding, Weather Report/Return to Forever styled jazz-fusion ripper, chock full of acrobatic bass, dizzying electric piano, intricate drumming, and wild electric guitar. The band gets a tad darker on "...And So to F...", a Collins penned number that slowly builds to a rumbling conclusion with Goodsall & Collins firing away on all cylinders. John's soloing here is intense to say the least, and a must hear for fans of McLaughlin, DiMeola, and Holdsworth. Of course, what better way to end this set than with "Nuclear Burn", a complete barnburner of a complex jazz-fusion piece that allows all the players to shine. As this is a soundboard recording, the quality is pretty good, and you'll be left wishing that there were more of these out there. Proof positive that Brand X in their prime were a lean, mean, jazz-fusion machine, Live at the Roxy LA is a must hear for any fan of the genre. With "Live At The Roxy LA 1979" We want the small Brand X series complemented by Percy Jones'remarkable solo album Cape Catastrophe complete from 1990, now (hopefully only temporarily) . In September 1979 guested Brand X as part of a U.S. tour two nights at the Roxy in Los Angeles. The second of the acclaimed evenings, the 23 September was recorded for a publication that should appear only 16 years later, however - almost centrally between the studio albums "Xcommunicaton" (1992) and "Manifest Destiny" (1997), with whom Percy Jones and John Goodsall (unsuccessfully)Brand X to resuscitate tried. Because there was only one official live release ("Livestock" 1977) before, to "Live At The Roxy LA 1979" enjoys great desires. Let's be honest: Right well tuned, the sound is still not, for ears-as apparently no changes to the source material have been made, its quality (master tapes) we can of course judge bad. Obviously there were sound problems at the club, because from about half of the concert the sound is a little better. "Live At The Roxy LA 1979" begins tough ... the concert intro, "Disco Suicide" is a few minutes too long and tiring rolled out, although Phil Collins begins sometime quite exquisite drumming. WithGenesis then gone astray (! I properly only "Duke", choke) you might prefer to call him a familiar, slightly modified Rock'n'Roll Quote: "Hold 'Up and play' drums'! And that's what he does in this intro, which finally merges seamlessly into "Algon" from the then-current "Product" and - thanks in Collinstrain and pressure - can increase enormously. This is of course well represented with a total of three takes - the sales figures should eventually be pushed. The slightly freejazzige "Dance Of The Illegal Aliens" adapts perfectly. The dialogues between the guitar, fretless bass, Mini Moog and the Yamaha CP-70 piano are terrific! In "Do not Make Waves" is allowed Philip to sing at last (once) and makes it to the straight abrockenden, but sound-wise slightly confused active number quite well. "Malaga Vergen" from the great "Moroccan Roll" album grooves is determined in a real room into what is being enthusiastically received by the audience that after the final Höhenrausch with "... And So To F. .." for minutes frenetic applause unpaid. The bottom line is to report: great record! Should sound fetishists might hold back anything, unless they are on top of fans. Because for Brand X trailer is "Live At The Roxy LA 1979" regardless of such Nickeligkeiten course a must! This album is a reissue of a 1979 live in one of the most famous theaters in Los Angeles. After "Livestock" from 1977 and partly composed of unreleased tracks, the "Live at the Roxy" turns of a different nature, more "pop / rock", including the introduction song of Phil Collins who has already stated in Genesis ('Duke' will be out soon). Brand X remains a group of jazz-rock high-level technical (listen to the bass and drumming on "Malaga Vergen" in particular). But the problem comes from a sound recording which sometimes gives the impression of listening to abootleg so it seems stifled making difficult immersion This is particularly unfortunate because it plays, it grooves, in a word c ' is musical (and the public expresses his joy that matter). In the end, we particularly note the first song "Disco Suicide / Algon" which starts slowly but gradually raises the tension with some guitar arpeggios and a battery that also grows in strength or the incredible "Nuclear Burn" bringing finally its name so it seems atomizing everything in its path. This 2013 CD features 71 minutes of dynamic progrock recorded live at the Roxy Theater in Los Angeles on September 23, 1979. The band line-up here is: Phil Collins (on drums and vocals), Robin Lumley (on keyboards), John Goodsall (on guitar), Percy Jones (on bass), and Peter Robinson (on keyboards). The performers live up to their reputations, delivering a live show packed with even more energy than their studio recordings. Here, the guitar gets the chance to lead the band with some brilliant pyrotechnics. The riffs are stalwart and nimble, the type of stuff one expects from a master guitarist. The percussion is hyper and durable, often exhausting in its deliver of pounding rhythms to motivate the audience's dancing feet. The keyboards contribute a bevy of fluid melodies, undulating with serpentine disposition and spilling through the rest of the instruments like a shower of hot honey. The bass smolders with ebullience and delightful bite. One track features lyrical vocals, while another has vocals that are more of a chanted anthem. Many of these tunes come from the Product album, revealing the band's versatility in balancing powerhouse songs with more delicate, almost floating pieces. One piece offers the performers the opportunity to exhibit their skills in solos. Overall, though, the tunes are high energy and surging with the dazzling gestalt of all the instruments blending into a satisfyingly awesome fervor.